Get My Book Wizarded Away 🧙‍♂️ For Free On Kindle! Hey there everyone, for the next five days my kids fantasy book will be available for free download on Kindle. 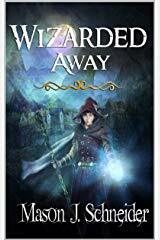 You can get your copy of Wizarded Away 🧙‍♂️ for free by clicking here! Look, I know it’s hard. You sit down in front of your keyboard with all the motivation in the world to bust out your next great novel. You get about a page in or so and you start to think about picking it back up the next day, or later on that night or whatever….